This method is running fine but for writing the new master server IP in your Windows HOSTS file you DO (must) change security options about your Windows HOSTS file (about "pc-account_users") about Windows 8 and 8.1 (32-bit or 64-bit) and often on Windows Vista; Windows 7. You DO (must) give "FULL CONTROL" about your Windows HOSTS file (about your "pc-account_users") for writing in it! In reality security options (by default) is a function of security options that you choose when you installed your Windows OS. 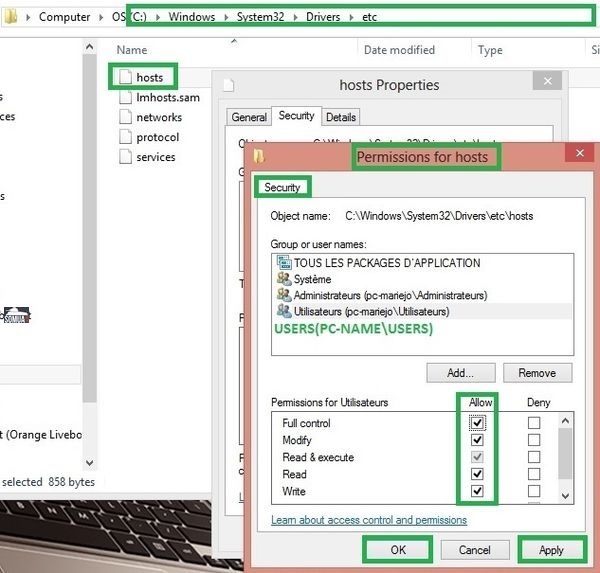 After by security do not forget to restore security by default about your Windows HOSTS file! Thank you so much for all this hard work! As well as AX, the Modded Midway server is one of my favourites. Does anybody know how to contact them to change over? trumad wrote: Thank you so much for all this hard work! http://www.bf1942.org/ is the website, it's already announced there. Great work, it works perfectly! Thanks a lot. I hope you don't mind, but I have written a small program which can apply the fix automatically, change all the files etc, to make it easier for people to do. It also prevents the Windows 8 Smart Screen message, which shows a warning when you want to run the fixed .exe, saying it is not verified. It includes a built-in updater, so if there ever comes a new version it can be easily released (as long as people run the program of course...). If any of you can give it a try to test it, that would be great! I have personally tested it with Origin, and PC should work as well, but I don't know for sure. Use at your own risk of course, but the program will backup any changed files so you can go back (but make a backup yourself as well!). Please let me know what you think of it or any other comments you may have. Just some quick instructions if you choose the replacement master server. Would it be possible to create a simple setup.exe which will just automatically replace the necessary files? I think many people prefer setup files. I'm not a programmer myself but I guess it can't be that difficult to implement...? Hi, first of all thank you for your Gamespy fix. I just have one suggestion for broadcasting it on your servers as I like playing on thems , you still have the dated deadline of May 31, EA games will close June 30. I think updating it to reflect that will help tell people that this is still happening and they still will need to update their BF1942 files. Also I agree with Seventy's suggestion, making this as easy as possible is ideal. You have to install it, and then when you run it the first time it will apply the fix. It also includes a undo function.